Countries show a wide range of system performance and transition readiness scores. On average, performance scores in environmental sustainability are the lowest, while security and access scores are highest (Figure 3). Differences among different country categories in both system performance and transition readiness are elaborated below. 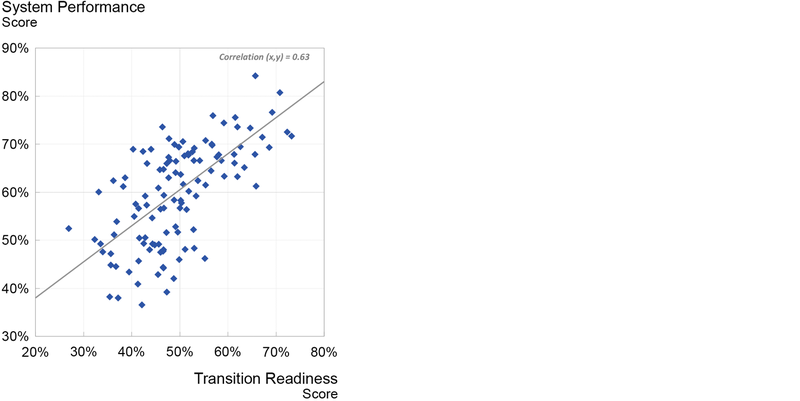 Comparing performance and readiness shows that countries scoring high on transition readiness are more likely to have high system performance (Figure 4). The relative importance of different transition readiness dimensions is likely to vary, depending on the countries’ specific energy system challenges. However, the absence of enablers along the six dimensions is expected to slow down long-term system improvement. When performing well across regulation, capital and investment, institutional stability, infrastructure and business environment, and human capital, countries are four to six times more likely to rank in the top performance quartile. On the other hand, all 28 countries with the highest measured readiness rank in the top half of the index. Countries are moving in the right direction, yet the pace of progress is not sufficient to address the challenges of the global energy system. Transition pathways differ among countries, but lessons can be learned from improving and well-performing countries. Peer group analysis and a country-level indicator assessment can contribute to countries’ transition vision and roadmaps. 47 Years for comparison (2013 and 2018) refer to the respective ETI results and 2013 data is backdated and used for trajectory analysis only.